Frozen is a Heartwarming Gem! How odd is it that, for the third straight time, Disney Animation has released a better film than Pixar? In fact, Disney’s Frozen – a very loose retelling of Hans Cristian Andersen’s The Snow Queen – is easily the best animated film of the year. Princesses Anna (voiced by Livvy Stubenrauch) and Elsa (Eva Bella) were close – even more than the usual pair of sisters – when they were very young. At least, they were until Elsa accidentally zapped Anna with her power to create and control snow and ice. Anna was saved by a wise old troll, but Anna, horrified by what she’d done, vowed to never hurt anyone again and locked herself away from everyone – hurting Anna more than she could ever have imagined. Then, during her self-imposed exile, the girls’ parents died in an accident – leaving them completely alone. On her eighteenth birthday, Elsa (now voiced by Kristin Bell) has to appear in public for her coronation, though she still remains apart, causing further pain to Anna (Idina Menzel) – at least until she meets Prince Hans (Santino Fontana) and falls in love with him at first sight. He certainly seems to reciprocate – but when they approach Anna for her blessing, she refuses. When pushed by Anna, Elsa loses control and changes summer to winter in the blink of an eye. Once again horrified by her powers, she flees to a nearby mountain, where she decides that she will be perfectly happy by herself. 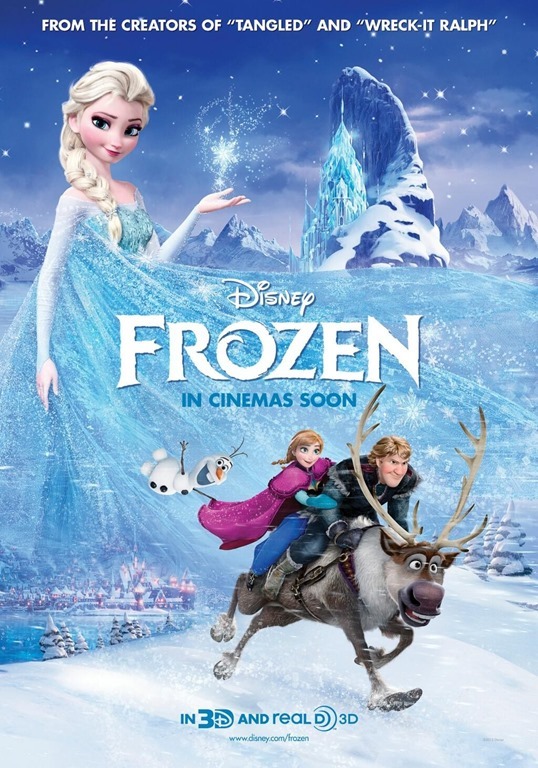 Anna, blaming herself for Elsa’s outburst, follows to persuade her to return – enlisting the aid of handsome mountain Kristoff (Jonathan Groff) and his reindeer Sven. As they seek out Elsa, they encounter a living snowman, Olaf (Josh Gadd), who was created during Anna’s flight. Although this is yet another ‘princess movie,’ in the tradition of classic Disney animated films, the princesses aren’t just empty-headed, pampered elite – they’re richly drawn people we can relate to. And though Elsa accidentally does some scary things, neither she nor her sister is an antagonist. There is an antagonist, but that’s very much a minor part of the story. Frozen is very much a character driven film – the key moment in the movie is an act of true love – and while it is not a traditional act, it makes such perfect sense that the initial ‘Wait! What?’ moment is closely followed by a, ‘Of course!’ moment. In most of Frozen’s characters, there is a sense of the traditional that is undermined. Kristoff, for example, is a big, clumsy guy whose appearance screams ‘genial lummox,’ but he is smarter than looks and, perhaps, wiser. The only character who is exactly what he appears to be is a cranky, mean-spirited duke (Alan Tudyk) from a country that trades with Arendelle. Even the comic relief snowman is an unexpectedly nuanced character. Frozen was written by Jennifer Lee (Wreck-It Ralph) and and co-directed by Lee and Chris Buck (Tarzan). It’s the first time a woman has had a directorial credit on a Disney film – which makes perfect sense for a story that is, at its heart about sisterhood. Although Do You Want to Build a Snowman is a potential Disney classic, most of the movie’s songs – including Elsa’s declaration of independence, Let It Go, and the sisters’ duet, For the First Time In Forever – are brilliant. Songwriters Kristen Anderson-Lopez and Robert Lopez may not be familiar names now, but they soon will be. On top of an excellent story and terrific characters, Frozen is also animated as well as anything Pixar has done lately and the use of 3D adds immeasurably – especially in the snow (gently falling, blowing, swirling) and ice effects. In every particular, Frozen is a brilliant achievement – and the best film Disney has produced since The Lion King. It may be snowbound for most of its running time, but Frozen is a heartwarming gem. Adding to the fun, Frozen is preceded by the delightful Mickey Mouse short, Get a Horse – which celebrates Mickey’s 85th Anniversary by taking Mickey from the year of his hand-drawn debut through to the world 3D, and CG. Previous PostHomefront: Darker Than The Usual Jason Statham Movie!Next PostSundance Channel’s The Red Road Adds Lisa Bonet for Multi-Episode Arc!